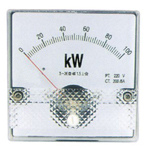 Note:for 60/75/100A direct meter,the class is 2.5. Advantage :The scale can be easily changed without opening the front frame so that the class will not be influeced. Feature:The scale can be easily changed without opening the front frame so that the class will not be influenced. 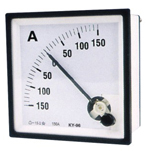 These meters can measure the other non-electric values for examples,temperature,special and so on. 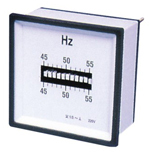 For 3 phases circuits,balanced load 45-65Hz and for 1 phases AC 50Hz. Scale graduation:0.5 cap-1-0.5ind 0.3cap-0.7ind 0.4cap-1-0.4ind 0.7cap-1-0.3ind. Type of current:1P,3P,3W circuits,balanced load. Operating current:if used with CT,the secondary current 5A or 1A is standard. Wattmeters or Varmeters with built-in converter for 1 phases,3P,3W,3P4W.